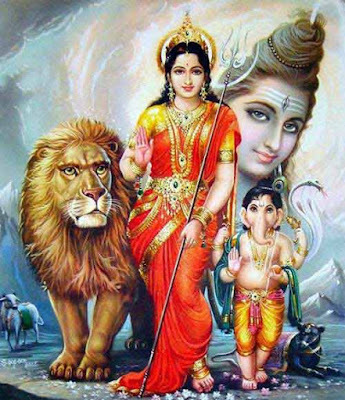 Bheemana Amavasya or Bheema Ammavasai Vrata observed in Karnataka on the Amavasi (new moon day) in Ashada month is based on an unparalleled devotion of a young girl for Lord Shiva and Parvati. Women and girls conduct special puja on the day for a happy and prosperous life and for the wellbeing of brothers and husbands. The popular story, or Katha, associated Jyoti Bhimeshwara puja is known as Bhagirati Nadi Hogi. Legend has it that once a Brahmin couple decided to travel to Kashi to pray to Lord Shiva. But they had a daughter, a young girl, and the couple was not ready to take her with them as they did not want to risk her life. The journey was long and they were not sure whether they will make it safely. So the Brahmin couple decided to leave the young girl with their elder son. The elder son was married and they left the daughter with him and said that if they did not return he should get her married. The parents did not return after a year and the brother and his wife was worried that they would have to marry her off. He did not want to spend money on her and instead he had an eye on the property and money that the father had left for this daughter. The brother one day happened to hear a strange announcement made by the King of the region. The son of the King died yesterday and he would like to have him married before he is taken to pyre. No one was ready to take the offer but the greedy brother did. He and his wife dressed up the young girl and took her to the King and got her married to the dead prince in exchange of gold. After the marriage ceremony, the king, the soldiers and the young bride carried the corpse to Bhagirathi River to burn it. But suddenly there was a heavy rain and all the people except the young bride left. The King asked her to come with him as she is now a princess but she did not go with him. Instead, she decided to stay with the dead prince. Looking at the dead body of the prince she thought this would not have happened had her parents were here. The night passed and next day was Ashada Amavasi and the puja day. She remembered her parents observing the Vrata. She took bath and dug up clay from the riverbank and made two kalikamba lamps. She made wick from fiber of a fallen tree and did the rituals as her parents used to do. She also made mud balls instead of the kadubus. While she was performing the puja, a young couple appeared there and asked her what she was doing with the corpse and what was this puja for. She explained her fate and said she was now alone and there was no one to break her Bhandara or mud balls. The young man agreed to break it. He smashed the balls and blessed her – Dheerga Sumangali Bhava (Have a long and happy married life). The young girl smiled and said how can that be, my husband lies there dead. The couple looked at the dead prince and asked her why she has not woken him up. Go and wake him up. Hesitantly she shook the prince and he opened his eyes. She could not believe her eyes. Soon she realized who the couple were but when she looked up they were gone. She prayed to the divine couple – Shiva and Parvati – and narrated to the prince all that happened. When the king and the courtiers returned to burn the corpse, they found the young girl and prince praying to Shiva and Parvati. The word soon spread and from that day people started strictly observing Bheema Amavasi in Ashada month with the kalikamba lamps – lamps made from mud. How to perform Bheema Ammavasi Puja?